In a NASA press release today, the aims of the STS-125 shuttle mission were established. The mission is to equip the space telescope with new capabilities, including the Cosmic Origins Spectrograph (COS), and the new Wide-Field Camera 3 (WFC3). Included with these two major upgrades will be new stabilizing gyroscopes, and new batteries and thermal protection. These improvements should extend the telescope's operational life to 2013. The Cosmic Origins Spectrograph will enable astronomers to further probe the primordial "cosmic web" whose effects can be seen in the actions of intergalactic gas and galaxies. The ability to peer that much further back into space may help our current understanding of the Big Bang. The COS may even help in unraveling the mystery of "dark matter". The Wide-Field Camera 3 will enable the Hubble Space Telescope to create images with a much wider field-of-view. Think of it as an Ethos eyepiece for the Hubble Space Telescope. 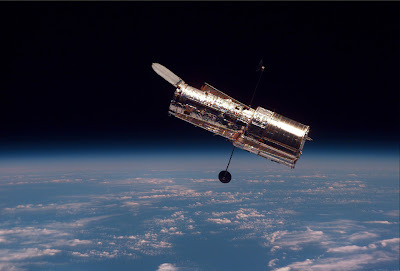 The Hubble Space Telescope in orbit 350 miles above Earth's surface. STS-125 will be an 11 day mission, comprised of 5 spacewalks. Among the new parts will be repairs to existing systems, the Space Telescope Imaging Spectrograph (STIS) and the failed Advanced Camera for Surveys(ACS). These two items will hopefully be restored to full functionality, in addition to the new functionality provided by the COS and WFC3. "Our two new instruments, plus the hoped-for repairs of STIS and ACS, will give astronomers a full 'tool box' with which to attack some really profound problems, ranging from the nature of dark matter to dark energy, to the chemical composition of the atmospheres of planets around other stars." This is really exciting news, as it means more discoveries are yet to come from Hubble, among which may be some of the most significant of our time. Unlocking the secrets of dark matter could give us a true understanding of gravity. Amazing article. Receive the nearly all trustworthy, basic along with concise job producing testimonials centering on your solutions furnished by the superior firms within this reverence. Currently follow-up Cash Advance Cheers pertaining to wonderful article.